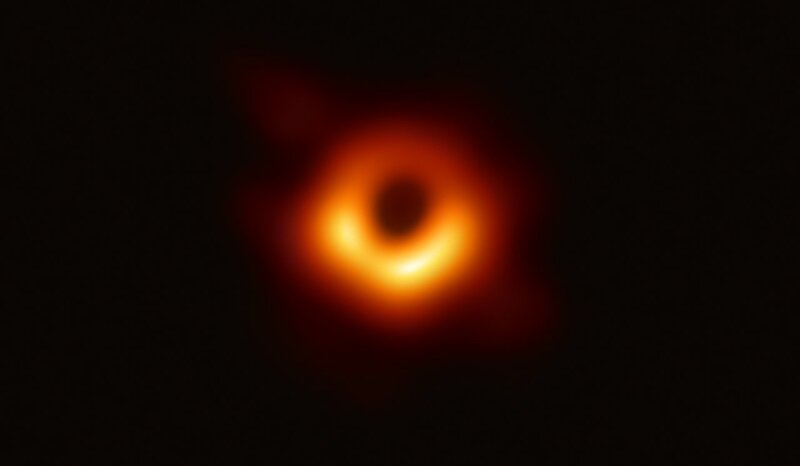 The story about the imaging of a Black Hole in M87 was fairly prominent news last week, but most articles were pretty brief. Thes articles in the links below get at some of the details most articles miss. Somewhat recently I wanted to generate a chart that had just a single bar in it, but with different segments on the bar to denote the amount of time spent in different parts of an overall process. This is variant of the nested horizontal bar chart I wrote about last time. I didn’t want a y-axis label — there’s only one bar in this case (albeit sub-divided). So having a label seems redundant. I did still want a larger shadow bar to show overall time — sometimes I might have segments that don’t quite add up to the total amount of time. In my scenario that was okay but I still want to see that overall time. I wanted to put the legend somewhere convenient — in this case I opted to spread the items across the top of the chart. I also wanted to minimize the vertical size of the chart since I only had one bar in it. To start with let’s say we have this as our sample data set. As in the previous post when embedding bars within bars, we add each segment using the same vertical offset (y_pos) but a different horizontal position. To prevent that we need to trick Matplotlib just a bit. The way we do that is to add a bar with a zero length. To omit that we just set y_ticks. Normally adding in a legend is pretty trivial. Getting the legend in this particular format — spread across the top — is a little more involved. We need to set up a set of anchor values. But what are anchor values? # Set up the legend so it is arranged across the top of the chart. There is a good StackOverflow discussion about the 4-tuple anchor values. The Matplotlib legend location docs are also pretty good and authoritative legend options. In practice it probably still takes a bit of playing around to get a feel for how this is working. The resulting chart served my limits. The are limits to the number of items that can comfortably fit in this kind of chart though. If you are going to have the legend identify every segment then that is going to continue to use more room of course. But in addition I found that you have to pay attention to color selection when adding more segments. The resulting sample code in full is shown below. # Set the vertical dimension to be smaller..
# 3.5 seems to work after a bit of experimenting. # Sum up the value total. # In this case we expect only 1 item in the entries list. # to keep the size of the bar smaller on our actual data. # Otherwise the bar will use all available space. # Is there an 'outer' or container bar? # Now go through and add in the actual segments of data. Matplotlib is pretty much the primary library for creating charts in Python. This library has been around for a while and there is a good amount of documentation on using it. However, there are some examples that aren’t very common. One kind of chart I am using for some data visualization work is to embed a smaller set of bars inside a larger set. This is similar to a stacked bar chart kinda but with a couple of differences that provide some other features in terms of being able to represent relationships in the actual data. This type of chart allows you to convey information about an overall metric and then break it down into component metrics, or perhaps show a related set of metrics right on top of it. And truth be told another motivating factor is that it can buy you some vertical space in a chart. Since I haven’t found many examples of this I thought I would post one. title = "A Basic Horizontal Bar Chart"
This will produce the following chart. 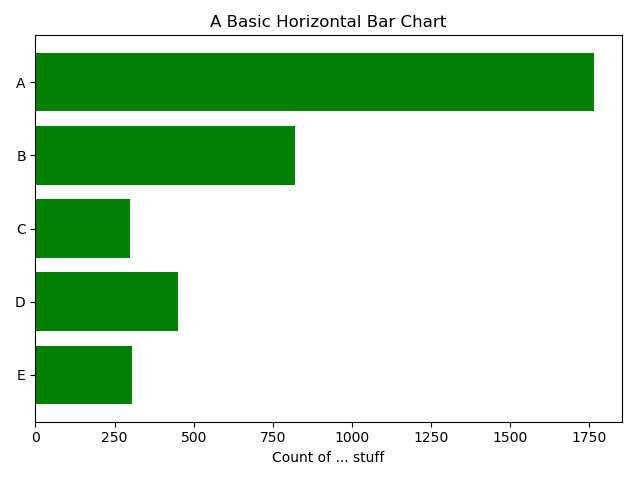 A basic horizontal bar chart in matplotlib. From the basic horizontal bar chart above it isn’t that far a leap to embedding bars. All we are doing is adding the additional bars with a smaller ‘height’ (you can think of it as width if you prefer) but using the same vertical position as the first bar. nested_bar_height,   <-- Make the nested bar smaller. Additionally, for each nested bar after the first one we need to adjust the horizontal starting point. To illustrate this we’ll add two smaller bars inside each of the main bars from the first chart above. The additional code is highlighted in blue. # Set up the primary bars. # Now add the first set of nested bars. # side by setting left appropriately. # is the same as the basic bar chart. And that’s it. There are some other variations that can be done as well. You aren’t obligated to start the inner bar at the left for instance — you can position that more in the middle of the bar if that makes sense for your data. Finally, this kind of bar chart is similar to a Bullet chart, as described by Stephen Few. With a bit more work the code above could produce a bullet chart too. Every database needs to have a way to load multiple records into it. With MySQL you can import a csv file, for instance. ElasticSearch has a way too and it generally works well. There’s just a couple important points to working with it that can trip one up. Bulk API entry point.In this example let’s say we have an index called ‘library’ (referenced in the previous blog post on ES) and in that we have a type named, simply, ‘books’. The API url will be have _bulk on the end of it. You want to view the data file as pairs of lines. The first line tells ES what to do — in this case index (ie. insert) an entry into a specified index and type. You can also delete or update content too. The second line is the actual content. This is pretty straight-forward as having the data for the entry. The one trick here is that you have to have the full entry on ONE LINE. If you try to split it up (say, to make the thing more readable) then that will confuse ES. So one line per entry. Finally… you must have a last blank line in your data file! If you don’t then you will likely lose the last entry. At my previous position ElasticSearch formed an important part of our back-end infrastructure, and over the past year and a half we were expanding our use of ElasticSearch. It wasn’t our primary data store but it became a highly important secondary store that we used to query our data in ways that would be difficult or prohibitive in our MySQL database. In general, the way you will interact with ElasticSearch is to use the REST API. Working with ES means learning this API, just as working with a relational database means understanding SQL. For the past year and a half I’ve been working with ES and having come to an understanding of it. I’ve been wanting to write up some of my notes and observations on ES and so this short article will probably be the first of a few such posts on working with ES. After you have added your set of documents in ES you will of course do different kinds of queries. ES will then retrieve the documents that match and compute a score value that is used to order the results. When you get back your results you can see this value as _score. What if the way ES scores documents doesn’t work for you though? What can you do then? It turns out that there is support for providing your own scoring function for documents. One of the features we used in most all of our queries was the ability to create a custom score instead of letting ES score documents. To illustrate the mechanics of this let’s say we create an index and add several documents to it. In this example we have a small set of books in an index named ‘library’. When you run this query you will receive back results ordered according to the score computed by ElasticSearch. Now that we have this basic query we’ll modify it to do our own custom formula for scoring. To introduce our own formula we add a function_score element that includes our original query and then specifies a script score. "script": "(doc['pub_year'].value / 1000) * 2"
In this case our script just took the publication year, divided by 1000 and then multiplied it by 2, which is admittedly sort of random…. but the point is just to illustrate the mechanics of how the query is constructed and to show you can access other fields in the document. "reason": "scripts of type [inline], operation [search] and lang [groovy] are disabled"
You will then need to restart ElasticSearch for this change to take effect. NOTE: This is sorta important! Making this change in ES is essentially allowing for code to be run via a query. You will want to be very sure to have ES nicely isolated in your network and behind some other API if you run this for real in production where you control what queries go to this. Now that we’ve done that we run into another problem. If you look at our results you will see that the actual score is not just the publication year / 1000 and multiple by 2, but some other number. The default behavior in ElasticSearch is to take your script score and multiply the computed _score by it. This can be somewhat unexpected since you explicitly provided a scoring function. The solution though is to set ‘boost_mode‘ appropriately, which in the case of just using our computed score is to set this to ‘replace’. SSH is one of those workhorse utilities that make lots of things work. Whole applications are built on top of ssh (for instance, Ansible). Being able to set up ssh keys is, from a functional perspective, what makes this really work well. Sometimes when setting up SSH keys things fail to work and it is not at all clear why not. A lot of these are fairly simple things that amount to user error. The problem with user error is that it can be hard to detect when you are falling into that. So… here’s a list of things to check…. When you try to ssh into your remote server, it fails because you didn’t specify the right key name, or made a typo. You copied your public key to the server with the name ‘authorized_keys2’ and your ssh daemon was expecting ‘authorized_keys’. (Or vice-versa.) It seems that the preferred thing now is just to use ‘authorized_keys’. The exact name is set in the /etc/ssh/sshd_config file with the parameter name ‘AuthorizedKeysFile’. Often you will have more than one set of ssh keys on your laptop for different servers. Maybe you have one set for work related machines and another for a side project. When generating ssh keys you are prompted to give the filename, and so you do that. So… then you try connecting to your server … and it isn’t working? “Why am I still being prompted for my password?” Well, you didn’t send the right key. Again, your local .ssh/config is your friend here (instead of having to specify the key all the time with -i). Add an entry IdentityFile=~/.ssh/my_server.rsa and on your laptop the appropriate ssh key will be sent to the server. Bonus points if you set up a different port for your ssh daemon to listen on. An easy mistake to make though is to neglect to use that non-standard port when you connect. In your ssh config you will want to add this by just specifying the port with simply ‘Port’. If you are still having problems, and if you are able to become root and manually run the sshd daemon in debug mode then you may find that helpful. Then you can watch both the client side and server side interact and see if you get any helpful messages from the daemon. A few months ago I started working with graph databases. This post is part of a series aimed at documenting how to work with a graph database, particularly for those coming from a relational database background. At a practical level, when first working with a database you want to know how to get it installed and running (which was the subject of an earlier post) and then how to do the basic CRUD operations: creating data, retrieving it, making updates, and then deleting things. The purpose of this post is just to focus on using Neo4j and the query language particular to that database, Cypher. One of the very nice features of Neo4j 2 is that they included a very friendly way to interact with the database by just pointing your web browser at it. This is not how you will work with Neo4j at scale but when learning to use it, it is invaluable. When working within the browser you generally enter one statement at a time. If you try to put two statements separated by a semi-colon, Neo4j will get confused. The first thing to note is that in Neo4j, you do not need to set up a schema first before you can start loading in and using the database. In fact there isn’t really a concept of a schema like you would have in a relational database, and in Cypher there isn’t an equivalent of the Data Definition Language (DDL) that we have in SQL; there aren’t equivalents for ‘create table’, ‘drop table’, ‘alter table’. If you are coming from primarily a relational database background then this feels a bit odd certainly. The example below shows how we might create a single node with a couple of attributes. Note that the indentation here is purely to enhance readability — Neo4j will process this fine if it is all on the same line. Note that there is nothing here in this statement that identifies a primary key. Nor do we have a concept of referential integrity between kinds of nodes. Enforcing uniqueness is possible using the MERGE command, which we’ll get to in a later post. Internally in Neo4j there is a unique node id and you can make use of that, but you shouldn’t rely on that much. Now that we have a node in here, how would we search for it? In general we can search using Cypher’s MATCH statement, which you can think of as the equivalent of SQL’s SELECT. Like SELECT, we use MATCH all the time when working with Neo4j. In this statement we have a ‘k’ in there before the attribute list. That is a variable that we can use elsewhere in the statement, and in fact we use it at the end in the RETURN clause to actually return the value. In fact, MATCH requires a RETURN, SET, or DELETE clause at the end, otherwise it the statement is considered incomplete. If you run this command in the browser, Neo4j 2.x will give you a D3-based visualization of your result set. You can click on the node(s) to show all the attributes. This kind of feedback makes learning and developing your graph statements in Neo4j very helpful in fact. Our statement here returned the entire node. If you want just a particular attribute you can return that. If we have a node that we just want to update a value in, or add another key-value pair? Again, we use MATCH but this time we end with a SET clause. In this case we updated the email column. If we wanted to add a new property we would just list it — there is no syntactic difference between updating an existing property or adding a new one. In SQL we would first have to alter the table to add a place for the new column and then we could set a value. Deletion is very similar to updating — we just specify to delete the node at the end instead of returning it. A point on deleting nodes — Neo4j will not let you delete a node if it still has edges connected to it. You first have to delete the edges and then the node. But as we’ll see you can do that in one statement. So, this is a graph database. A graph database with only nodes is kinda dull and uninteresting really. So how do we create connections? First let’s add a few more nodes to our system for demonstration purposes. We’ll also re-create ‘Alice’ since we deleted that node above. And, while we’re at it, we’ll also do this in one statement to show how to add multiple nodes at a time. A couple things to note here: we added a variable before each person we added (p0, p1, p2, p3). When adding multiple nodes we need to add something to distinguish between these, and as we create more involved queries the utility of that will become more evident. For now take it as read that if you omit that, Neo4j will complain that ‘Person’ was already declared. Now let’s find ‘Alice’ and create a relationship to Bob. So… this takes a little deconstruction. We started with our MATCH statement but instead of just retrieving one node we retrieved two. This is where those variables — p1 and p2 — come into place. You can think of them as being kinda/sorta like aliases in SQL. Once we find the two nodes we can create the link between them. Edges are always directed edges in Neo4j, and the edge is represented with the ‘start’ node followed by the relationship label and then the second node. The usual way of describing this is to think of an arrow connecting the two, as you might write it in ascii-art: ‘(first node)-[r:RELATIONSHIP_LABEL]->(second node)’. That ‘r’ is arbitary but you do need a variable there, otherwise Neo4j will give you an error ‘A single relationship type must be specified for CREATE’. At this point we have something that is becoming a more meaningful graph, albeit a small one. We have a few nodes and a relationship between a couple of them. Again, we use MATCH like we would use SELECT in a relational database. In this case we specify the relationship with that ‘arrow’-like syntax. You’ll notice that we specified p1 to be ‘Alice’ by specifying the attribute, but we didn’t do so for p2 — p2 is what we want to find in this query. When you run this you should see just one node returned, ‘Bob’. At this point we have covered the very basic operations involved in creating, updating, and deleting nodes, and we started in on how to create and query on edges. In this next post on this topic we’ll continue the discussion on setting up edges and more involved queries. This post pertains specifically to Bukkit, which is no longer available due to a DMCA takedown request, and the future of Bukkit is somewhat in question now unfortunately. Getting started developing in any platform always has a learning curve as you find your way around the language(s), tools and conventions involved. Developing plugins for Bukkit is no different. There are a number of good tutorial resources on this topic, so rather than do a full write-up we’ll link to a couple of tutorials and then add some additional comments to outline the process and identify some of the things to watch for — the ‘gotchas’ of plugin development. Install the following tools to set up your development environment. Download Oracle’s Java SE JDK (the JRE alone is not sufficient). Go ahead and install that first since you will need this to run Eclipse. Bukkit Coding for Dummies — a 10 page Google Doc covering pluggin development using Eclipse. This has some useful screen shots and code examples. How to make a Bukkit plugin — This site has several similar examples, also with screen shots and code examples. To pick one tutorial, take a look at Part 10 on invisibility and custom books. 2. Create a new Java Project. 4. Write up your plugin (see the tutorials above for more details there.) Be sure to import the appropriate libraries as needed. 5. Create your YML file for your Pluggin. This is where you will list the commands your plugin recognizes. 6. Compile your code into a JAR file. Select your project in the Package Explorer and then Select Export -> JAR File. Uncheck .classpath and .project from the resources to export, and select the location for Eclipse to save your jar file. You can click through to the next couple of screens but the defaults after this should be fine. You can also just hit ‘Finish’. 7. Copy your jar file to your Minecraft server’s plugin directory and start up Minecraft. Minecraft should recognize the plugin and load it. You should see this if you tail the logs/latest.log file. Things that may trip you up…. Q1) I can’t compile my plugin but my code looks right? Except that Eclipse doesn’t recognize JavaPlugin and a bunch of other names? Go to your projects properties and go to the Java Build Path section. Click on the Add External Jars button and find the craftbukkit jar file on your computer. Q2) Why is my plugin not running on my server? It runs okay on my laptop? You can’t load a plugin compiled with Java8 on a server where you are running Bukkit with java7. So what are you supposed to do if you can’t control which version of java is running on the server? Go to your projects properties and go to the Java Compiler section. After that try re-building your jar file and try that. Q3) In my java code I added a command, but I can’t invoke the command? Somewhat recently I’ve been spending some time investigating graph databases, and Neo4j in particular. This first crept onto my radar a few months ago as it relates to an ongoing side project I’m involved with, but at the time I didn’t have the cycles to look into it. More recently another potential application for a graph database came up in the context of my regular day job. Paying attention to the ques I’m getting from life, therefore, it seemed like the time was right to get better acquainted with graph databases. Not that I’ve spent a bit of time on this I thought it would be worth writing about that. So far I’ve focused more on Neo4j, which has been around for a little while now. I have started to look at Titan some, and Giraph is also on my radar. I know there are other graph databases out there as well, but for the moment it seems that looking at these three are plenty to keep one busy. For what it is worth, I have been able to get up and running more quickly with Neo4j. Neo4j — as well as Titan — are java-based server applications, so you’ll want to have java set up on your server. There are some pretty good instructions for doing this on the Neo4j site too actually, so mainly I’m documenting things for (and from) my own experience. In my case I was setting up Neo4j 2.1.2 to run on a Fedora Linux cloud server. Or with Oracle’s Java… I kinda like to get the .tar.gz and unpack this under /opt myself. You can also get the RPM and install that. In the default AWS AMI Linux, /usr/bin/java points to /etc/alternatives/java, which itself points to openjre. I just change that to point to Oracle’s Java. If you work in Python, then while you are at it you may want to install the python library to access the database. 2) Create a neo4j user on the system. This is recommended practice I think, but isn’t super-required. Pretty much you can run under whatever user you like. Go and download the Community Edition of Neo4j appropriate for your environment. (There is also an Enterprise Edition but you should have a license for that, although if you fill in a form on the Neo site then you can play around with the Enterprise Edition for free if you are just kicking the tires, doing a student project, etc.) The Community Edition is released under an Apache License.) Unpack this somewhere convenient… perhaps just /home/neo4j or /opt/neo4j, as suits your preference. Increase the number of open files allowed. The default configuration should be fine to start with, particularly if you are just running on your laptop. But if you are running on a server you set up somewhere you will need to adjust the configuration to have it be accessible on something besides localhost (127.0.0.1). 6) Start the neo4j server. In the neo4j bin directory you should see a file named simply neo4j. That’s a shell script that lets you start, stop, and get the status of the server. process ... waiting for server to be ready...... OK.
At this point you can bring up your web browser at the appropriate url for your server and you are good to go with working with Neo4j. The server has a very user friendly interface that allows you to start doing queries and adding in graph data. There is a lot of helpful tutorial information there right off the bat too. In the next post I’ll cover more about the graph data model and working with Cypher — Neo4j’s query language. Sometimes you get into a situation where two separate issues conspire to drive you to question your sanity. For me this recently happened when I was trying to do a pretty simple operation: I just wanted to write out a result set to a .csv file from MySQL into the local file system. The problem (initially, anyway) was that I was logged into MySQL, ran the command, which worked without complain.. but when I went to look in the /tmp directory for my file… nada. So, tried the command again just to see what would happen. Now MySQL complained (quite rightly) that the file already existed, yet I didn’t see it. Initially I didn’t realize the problem of the private tmp directories though. My next step was just to try to write out my .csv file to a couple of other directories on the system. I set up a /mytmp directory and /usr/local/mytmp with appropriate permissions, but MySQL complained that it couldn’t write to the system. Huh? At this point I was confused… what was going on? In this particular case, the solution for me was to put SELinux into permissive mode, which then allowed MySQL to write out the my file somewhere I could have another script pick it up. At the end it was clear that these two problems, although separate, did converge in my particular use case. This is an example of Apparently pathological behavior in systems is the result of different components doing exactly what they are supposed to do. Once you understand each component and its behaviors the system makes more sense.